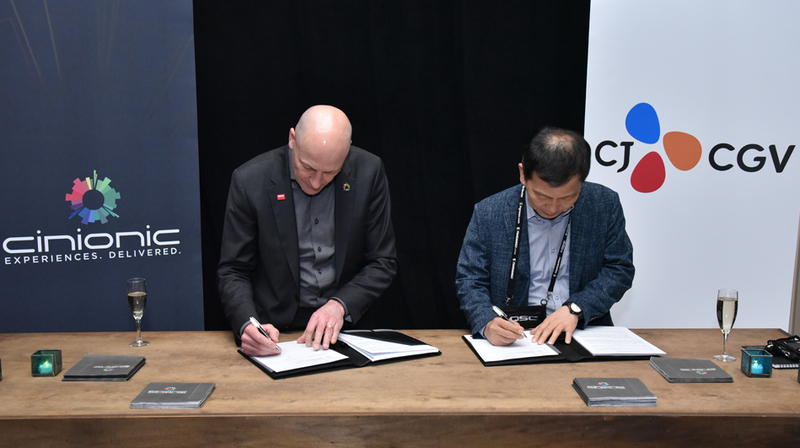 CinemaCon – Las Vegas, Nevada – April 24, 2018 – Cinionic has signed an exclusive deal with CJ CGV Cinemas, which has a significant share of its current circuit already outfitted with Barco projectors, as the cinema chain aggressively expands its footprint in Korea, China, Southeast Asia and United States. “CJ CGV and Cinionic are innovative operators in the film industry. Through this agreement, Barco projectors will power the next generation of CJ CGV cinemas worldwide,” said Seo Jeong, CEO of CJ CGV. Cinionic will provide CJ CGV Cinemas with a wide range of projection solutions to create premium, immersive moviegoing experiences. Offering 18 models to choose from, Cinionic can ensure the perfect match for every screen, enabling CJ CGV to offer the best image quality in all of its auditoriums. Join Cinionic in celebrating the pinnacle of cinema entertainment and see how we drive your success! See us at CinemaCon in the Milano and Neopolitan Rooms at Caesars Palace in Las Vegas, April 23-26.